Limited, signed and numbered copies, this is a hand bound book made of paper, paint, wood and ash. The printed photo images in this book are from my original paintings found in the unique edition.There are nine original paintings. They all refer to specific photos viewed on the U.S. Geological Survey website. The images are horizontal and vertical and when bound into pages create an outer shape like a volcano. As the pages are turned, their layers of images refer to the layers of ash, dirt and debris that are in volcanic eruptions. The first set of images in the book are prints of single paintings. The second group of printed images show the nine paintings in their combined arrangement. The borders of the single images are hand painted with several layers of white acrylic. These border layers are then scraped and peeled to reveal images below. 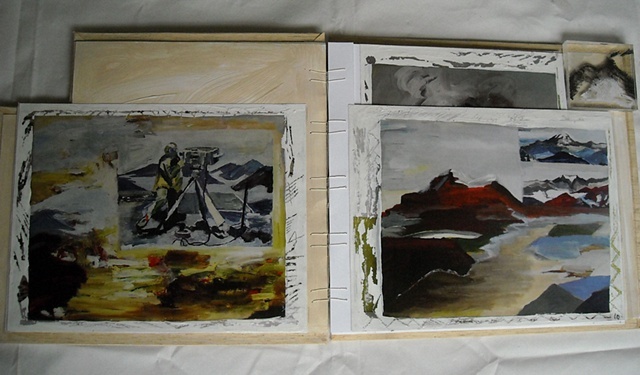 The borders surrounding the images in the combined arrangement also have been painted with layers of white acrylic.. On these an acrylic wash containing actual ash from Mount St. Helens was then applied as an overlay. Then the ash overlay was brushed into the printed photograph images of Mount St. Helens. Here the components of ash and photo print inks are allowed to mix , react, change and become new substances and images.